When it comes to viewing art created by others, it's often easier to feel discouraged than inspired. We see the work of masters in our chosen medium, and we despair, failing to envision that such skill could ever be ours. We envy their opportunities and recognitions and fear that there is no place in art for the things we are creating. While this is often our default reaction to skilled artwork, it doesn't have to be. I love to use amazing art as an impetus for my own growth and motivation, but it involves a shift in thinking to do this successfully. When I spend time studying art by other artists, I try to study a variety of artistic styles to help broaden my understanding of what is possible. This helps me to avoid being overly influenced by any one artist; I never want my art to appear derivative of someone else's signature style. I avoid feeling discouraged by another artist's skill by remembering that when I look at a masterful painting, I am only seeing a small part of the artist's story, one that doesn't indicate the years of skill development, the false starts and the planning that went into that one successful painting. I never teach alone. 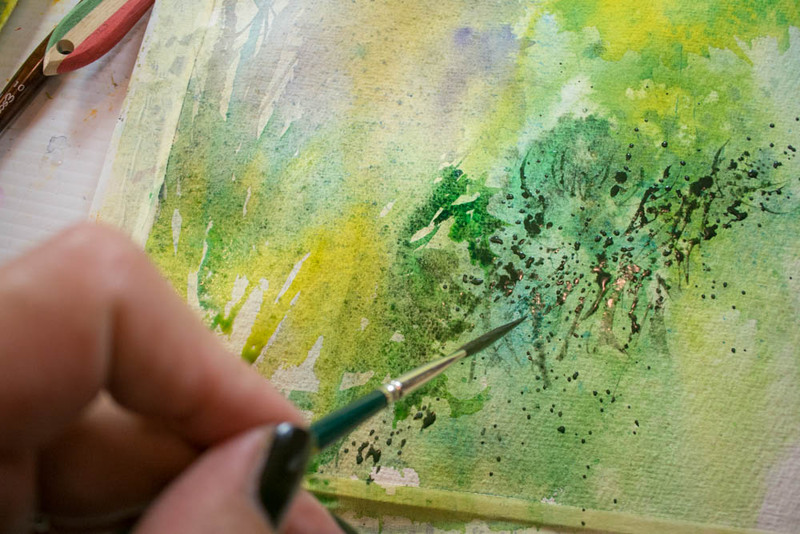 Whether I'm teaching an online class, a workshop or a demonstration, I will frequently reference art created by peers and mentors to inspire students, to spur ideas and to help show the amazing variety of artistic styles and content that can be created in watercolour. There are a few artists who I almost always include in my workshop talks as artists who have inspired me. Last week I spoke at The Gaslamp Gallery in Gorey, Ireland, and I promised my audience that I'd share my inspirations in writing here. Every so often I get an email from a student who has recently "discovered" me and, in doing so, has found a new aspect of joy and freedom in their art. I love receiving these emails because I remember sending the same one to Jean Haines years ago. Jean is such a highly acclaimed watercolour artist and her books are bestsellers. What has always struck me most about her art is the level of trust she has in her viewers. By creating paintings that are loose and suggestive, she tells her audience, "I trust you to see what I see and share in this experience of discovery," and this is so much more powerful than creating a painting where every detail is painstakingly defined. Additionally, Jean paints for sheer love of watercolour. This comes through in every painting she creates, in her voice when she teaches and writes, and in how she empowers her students. This freedom to paint for the love of watercolour has empowered me, not just to paint more freely, but in how I teach as well, and I'm proud to call Jean Haines a friend and mentor. I should probably just bring Tom Hoffman's book, Watercolor Painting, along with me whenever I teach, because I always mention his work when I'm talking about effortless painting. Tom's style is bold and minimalistic, and the impact he can create with just a few brush strokes is such a powerful example to students who are struggling with overworking. One of my favourite parts of painting in watercolour has been developing a signature brush style. I love using a variety of brushes to make interesting marks in my paintings, and I think this is a topic that is often overlooked in watercolour. We work so hard to master washes! I don't even have to open Sungsook Hong Setton's book The Spirit of the Brush to be inspired as the cover alone spurs me to be more playful in the marks I make in my paintings. She shares insight into Chinese brush painting in the book which is a fascinating discipline, and her contemporary interpretations add an additional element of individuality that is freeing to the student of watercolour. I am continually looking for ways to grow my creativity, and I am learning to recognize that influence can come from a host of sources and serve as inspiration and freedom so I can express myself more fully. I have a more complete list of my favourite watercolour books here. Who inspires you as you grow as an artist, and why?